Страницы: Пред. 1 ... 22 23 24 25 26 ... 43 След. [MINERVA-II1] September 21 at 12:25 JST. GATE 3 check was performed and the transition to the autonomous descent phase was declared “accepted”. The spacecraft has now descended to an altitude of about 300m. [MINERVA-II1] September 21 at 12:58 JST. The altitude of the spacecraft is confirmed to be about 200m. [MINERVA-II1] September 21 at 13:17 JST. The altitude display for the spacecraft has finally dropped to about 100m. In the control room, you can hear the sound of deep breaths around the room. [MINERVA-II1] September 21 at 15:30 JST: Communication with MINERVA-II1 has been confirmed. The rise of the spacecraft has also been confirmed, after the deployment of MINERVA-II1. [MINERVA-II1] Current altitude of Hayabusa2 is about 2.5 km. State of the spacecraft is normal. The lowest altitude attained was about 55m and separation time of the MINERVA-II1 was 13:05 JST onboard the spacecraft. На яп. яз. с синхронным переводом на англ. Уточнение. Время отделения MINERVA-Ⅱ1 - 13:06 JST. 21:21 - 20 сент. 2018 г.
Высота при съемке этого изображения составляла около 80 метров! 21:58 - 20 сент. 2018 г. 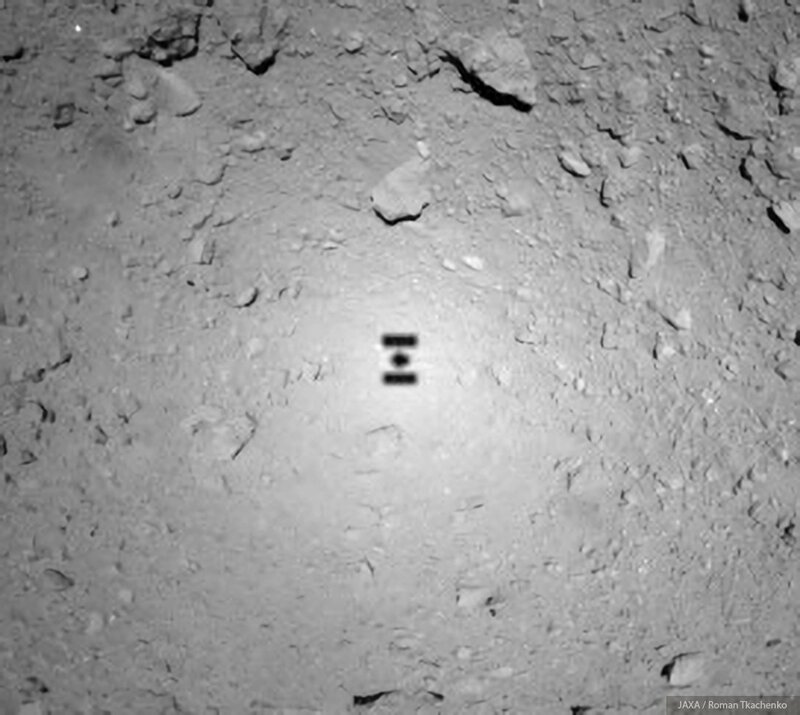 The shadow of Hayabusa2 on the surface of Ryugu!!!!!!!! GO, @haya2e_jaxa !!! 【MINERVA - Ⅱ 1】 22 сентября 15:00 JST: Зонд Сокол-2 вернулся в свое исходное положение (высота около 20 км), как планировалось. Состояние корабля нормальное. Работа по отделению MINERVA-II 1 завершена. Благодарим всех за поддержку. The mission operation to deploy the MINERVA-Ⅱ1 rovers will be conducted from September 19 – 21. On September 19, activities will focus on preparation for the spacecraft to descend towards asteroid Ryugu and on September 20, the actual descent will begin. 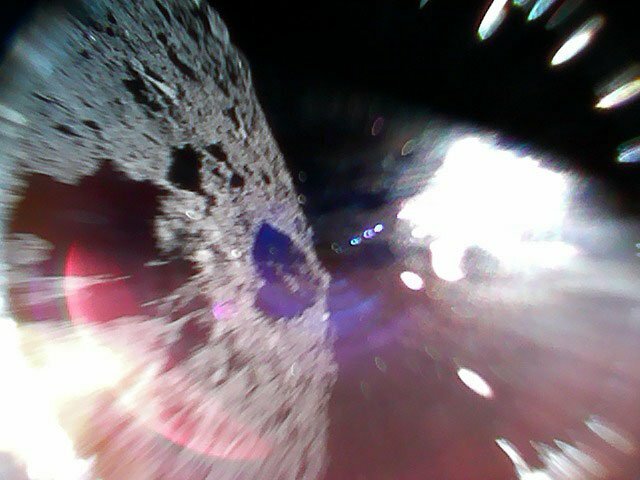 The scheduled deployment of the MINERVA-Ⅱ1 rovers is on September 21.
free fall：The speed of the spacecraft is not controlled, but falls due to the pull of Ryugu’s gravity. GCP-NAV：Ground Control Point Navigation, tool for image guided navigation during the descent operation. ONC-T：Optical Navigation Camera Telescopic (installed on the bottom of the spacecraft). ONC-W1：Optical Navigation Camera Wide angle (installed on the bottom of the spacecraft). ONC-W2: Optical Navigation Camera Wide angle (installed on the side of the spacecraft). constant descent velocity： the spacecraft descends at a nearly constant speed. At first, this speed is about 40 cm/s. From an altitude of about 5km, the speed is about 10 cm/s. Trigger Altitude：when this altitude is reached, the spacecraft’s speed will be controlled. 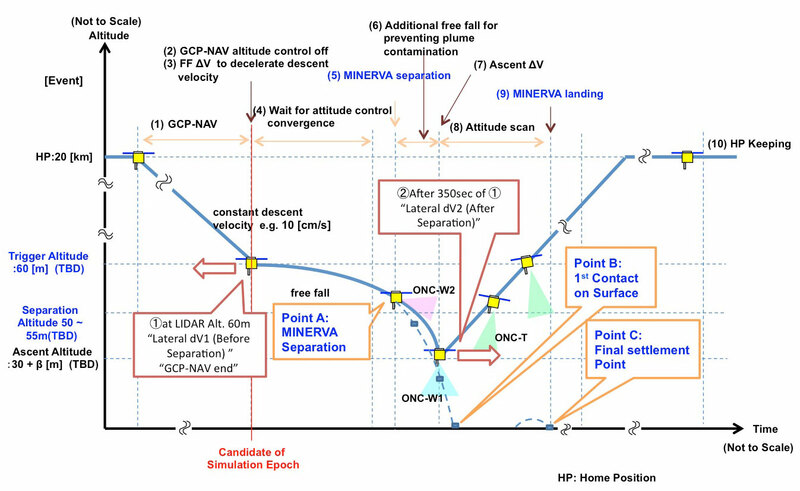 Additional free fall for preventing plume contamination: the spacecraft will not use thrusters during the period shown in the figure when MINERVA-II1 is in free fall. This is to avoid thruster gas hitting MINERVA-II1. С сыновьями Минервы одно из двух - или дело пахнет керосином. или они проснутся через 15 ? часов плюс минус от посадки. после того, как батареи зарядятся. С пресс конференции писал Миядзаки, по японски..
на вчерашней пресс конф выступали профессора Цуда и Кубота. В какой связи здесь MASCOT, который будет садиться в октябре - бог весть. Но сенсей Цуда говорит о продолжении операций через 15 часов после посадки..
A Senior NASA scientist I know described Hayabusa and Hayabusa2 as "sporty". Their approach is so different from NASA's. Always on a shoestring, always daring, always risking failure. Neither approach is better; humanity is better for having both safe and "sporty" exploration! "Старший научный сотрудник НАСА, которого я знаю, описал (программы) Хаябуса и Хаябуса 2 как "лихие". Их подход совершенно отличается от НАСА. Всегда на мели, всегда дерзко, всегда рискуешь провалом. Ни один из подходов не лучше. Человечеству лучше иметь два подхода в исследованиях - безопасный и рискованный." Ждем продолжения событий. Пока тихо. We are sorry we have kept you waiting! MINERVA-II1 consists of two rovers, 1a & 1b. 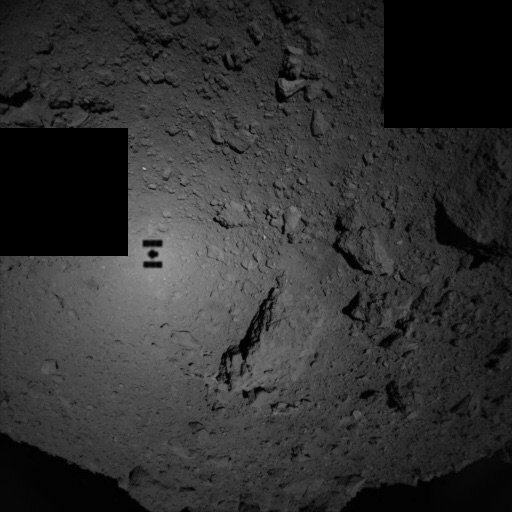 Both rovers are confirmed to have landed on the surface of Ryugu. They are in good condition and have transmitted photos & data. We also confirmed they are moving on the surface. 5:47 - 22 сент. 2018 г. This is a picture from MINERVA-II1. 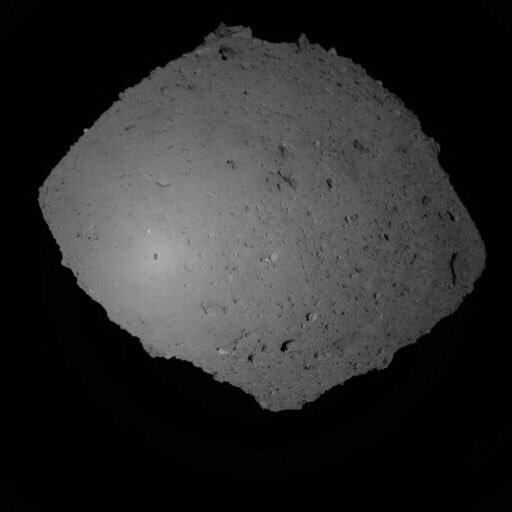 The color photo was captured by Rover-1A on September 21 around 13:08 JST, immediately after separation from the spacecraft. Hayabusa2 is top and Ryugu's surface is below. 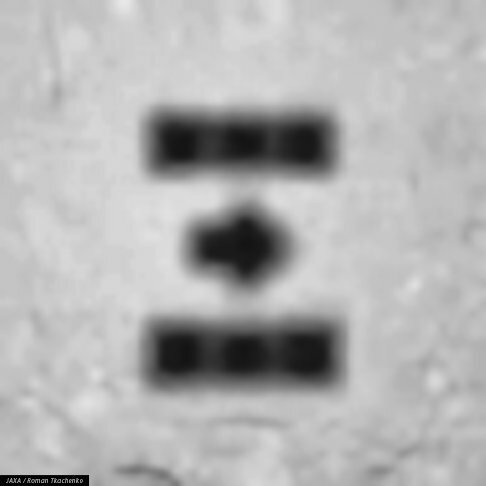 The image is blurred because the rover is spinning. 5:50 - 22 сент. 2018 г. 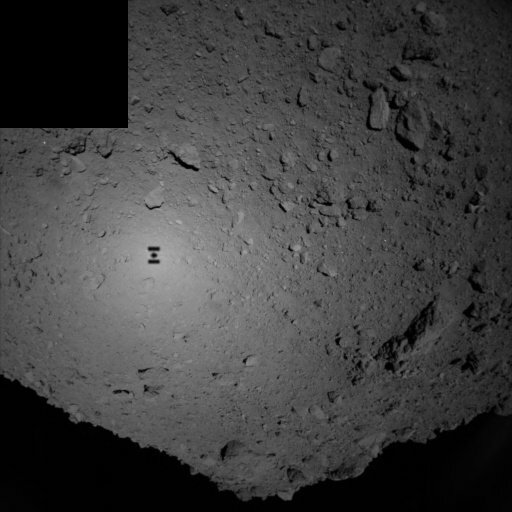 Photo taken by Rover-1B on Sept 21 at ~13:07 JST. 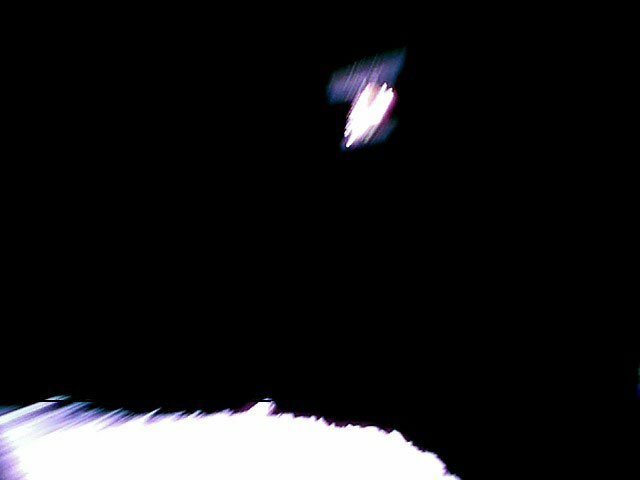 It was captured just after separation from the spacecraft. 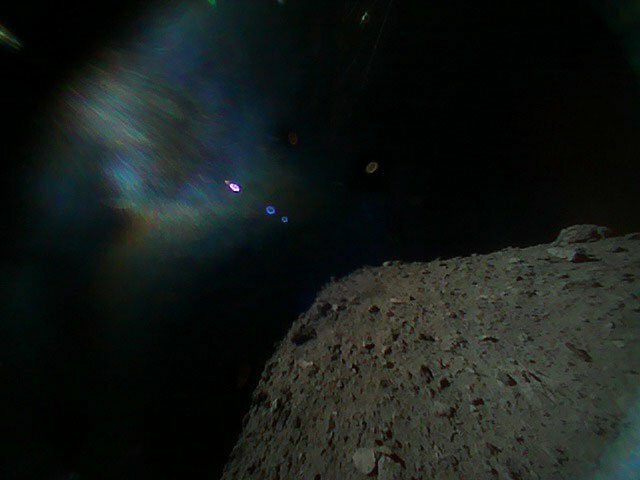 Ryugu's surface is in the lower right. The misty top left region is due to the reflection of sunlight. 1B seems to rotate slowly after separation, minimising image blur. 5:56 - 22 сент. 2018 г. 6:07 - 22 сент. 2018 г.